All pictures will open in a new window. PCVs Michelle White and Lisa Dold participated in the parade! My living room- love the pink! My dining room- love the big spoon! Coney Drive, Belize City. The house on the far right was my homestay house. Peace Corps Belize office, Belize City. hey thank you for the pics but how come we cant view the others? Please fix this please! It was pretty cool to see the one photo of Orange Walk Town. 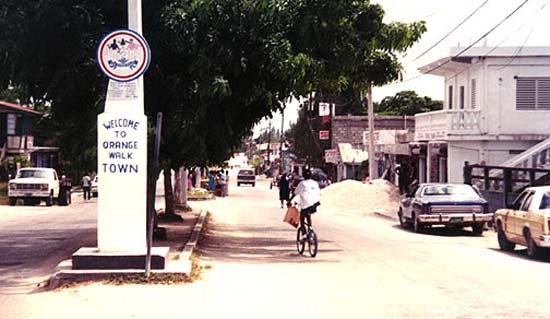 I served there, in the Peace Corps, from 1993-1995. I hope the townspeople are doing okay and that the politicians haven't ripped the people apart. I see that Johnny Briceno is the Deputy PM now. That's pretty cool--I always thought he was pretty forthright. These were actually my pictures- back in those days I had to send the pictures home to my friend, who would scan them and post them online. The website vanished without my knowledge a few years later, but the pictures are up at http://www.flickr.com/photos/lisa-p/sets/721576058 67282936/ .